Ottawa,ON Over 500 guests will sample the best organic and locally grown harvest prepared for FEAST OF FIELDS by top chefs. 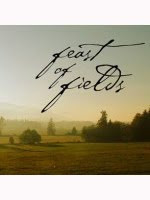 Canadian Organic Growers Ottawa presents Feast of Fields 2011. Food supplied by local organic farms is prepared by more than 20 premium local chefs. Organic beer and wine will be for sale to go with your gourmet meal! Children under 12 years of age admitted free with a participating adult.